Vaseline® intensive care™ healthy hands stronger nails hand cream. Deep moisturisation for 10 times stronger nails in just 2 weeks. With keratin, which deeply moisturises to help restore very dry hands. Best for: dry skin & cracked skin. With restoring micro-droplets of vaseline® petroleum jelly. Our hands are often the first to suffer from dry skin, taking a battering from the sun, low humidity and harsh cleansers that chip away at the skin’s natural barrier. In our Intensive Care™ Healthy Hands Stronger Nails formula, we have packed micro-droplets of Vaseline® Petroleum Jelly with powerful moisturisers into a travel-friendly size to give you restoring moisture on the go for very dry hands and help to stop your nails from breaking. 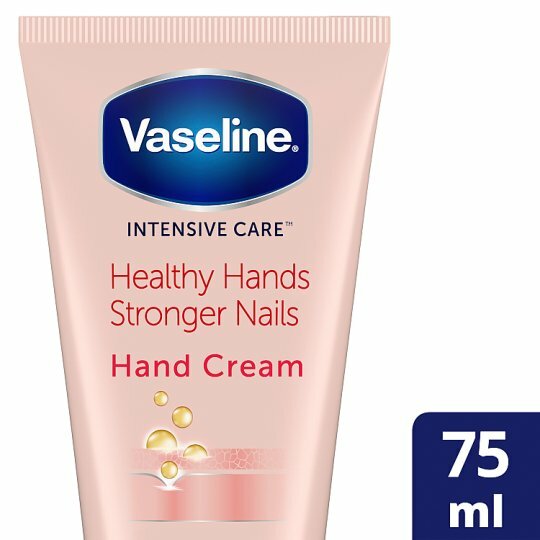 Vaseline Intensive Care Healthy Hands Stronger Nails 75ml hand cream comes in a compact tube so it is the perfect size to have in your handbag and use on the go. Also available in a bigger size, the 200ml pack means that you can be stocked up for longer, so you have the option of having a hand cream for on the go plus one for around the home.